A trigger for buy or sell signals can be obtained when a 9 day EMA called the “signal line” is plotted on top of the MACD. Traders typically use the MACD as a simple crossover, so when MACD crosses the signal line, they tend to buy or sell based on which way the cross appears.When MACD turns up and crosses over the signal line, bullish crossover occurs. Bearish crossover occurs when MACD turns down below the signal line. The difference between those two values can be plotted by a Histogram. The following are the steps to calculate the MACD of Macys. We will explore it by using Excel VBA so you have all the required tools to get started. The spreadsheet with the accompanied VBA is available for download at the bottom of the page. 1) Get the historical closing stock prices. The accompanied VBA in the spreadsheet does it for you. Simply key in the Stock Symbol, Begin and End dates. In this example, the parameters are M (Stock Symbol for Macy’s), Start Date as Jul-01-2014, and End Date as Sep-30-2104. There are two common setups for the MACD. The first is based on calculations using three-time periods : a 12-day, 26-day, and a 9-day time frames. The second is based on calculations using three different time frames: 8-day, 17-day, and a 9-day time frames. The time frames are basically trailing day averages. The MACD for the longer time frame is less volatile as compared to the MACD for shorter time frames. 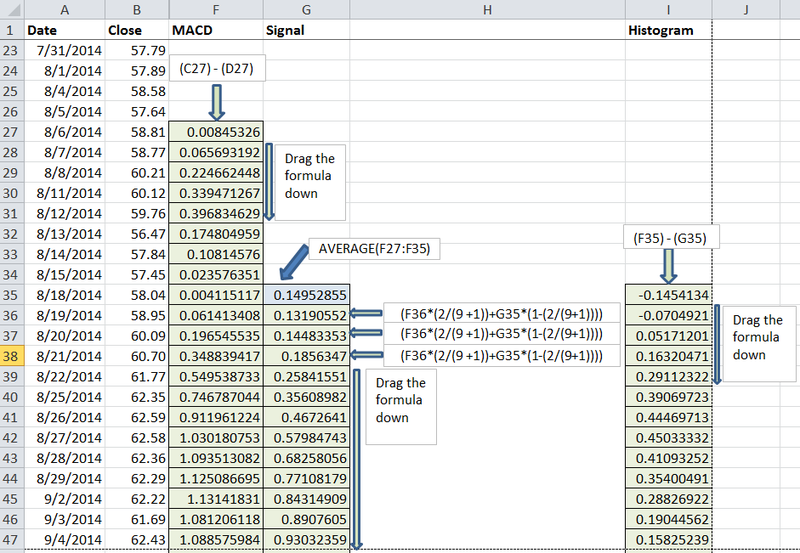 In this example, we will discuss computing MACD using 12-26-9 trailing day averages. where the Period is 12. From the Excel screen capture, columns A and B contain date and closing stock prices. Column C contains 12 day EMA. Cell C13 contains trailing 12-day average. Cells C17 onward contains EMA values based on the above equation. Notice that the EMA is a function of previous day’s EMA and today’s closing price. The calculations are illustrated using this screen capture. The same equation holds true for calculating 26 day trailing average, with period being 26 in this case. 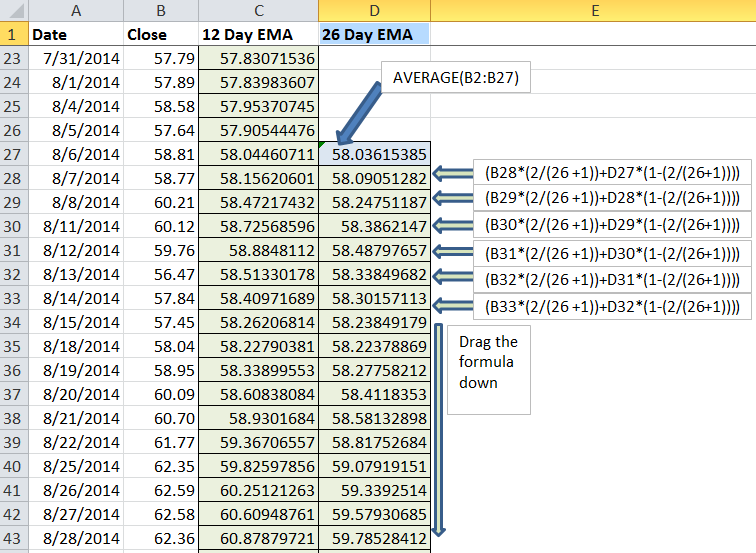 Column D illustrates the calculations behind 26-day EMA. The first value or cell D27 is average of the past 26 day’s closing prices, while cells D28 onward are given by the above formula. 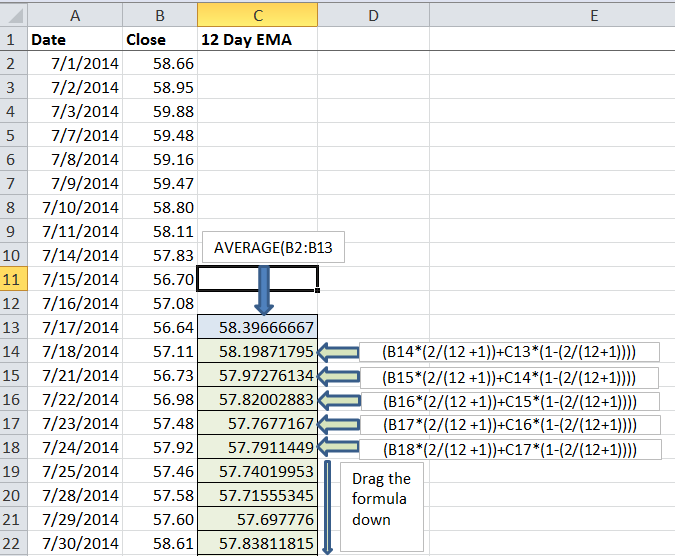 4) MACD is the difference between 12-day EMA and 26-day EMA as depicted in column F.
where the Period is 9. 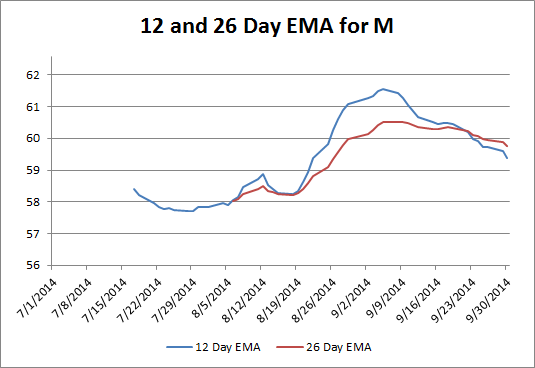 The chart below is the plot of 12 and 26 day EMA for Macy’s. MACD is about convergence and divergence of two moving averages. As you can see below that the shorter moving average (12-day) is faster and drives the overall MACD movement. The longer moving average (26-day) is less reactive to stock price changes. I am new to world of trading and finance. 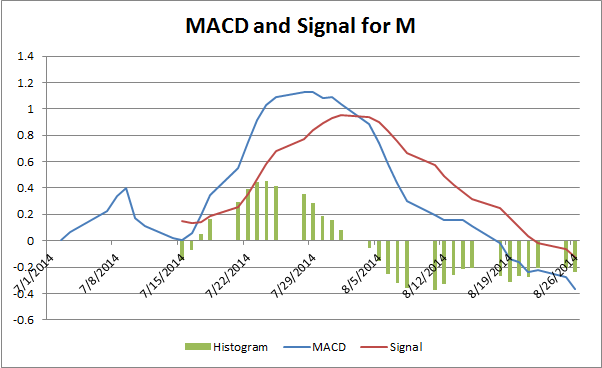 What are the main sources of bullish signals in MACD? A bullish divergence happens when the MA Convergence/Divergence indicator is making new highs while prices fail to reach new highs…. This excel VBA computes and plots Moving Average Convergence and Divergence (MACD), using Yahoo Finance Web Service – Please be advised that this Yahoo website has recently closed down. I am requesting that this Excel VBA be changed to Google’s Finance website to download the ticker data for both USA and Australian stocks. Thanks for bring that one up. I’ll soon migrate the spreadsheet models to pull from Google Web Service. VBA modules locked, asking for password.